KUITWA NI KUTUWA is the Swahili phase that means To be Called is to be Sent. In June a group of eight members of congregations in the Mid-south district Lutheran Church Missouri Synod went on a 10 day mission trip to Tanzania. Only one in the group was a formally called, the rest of us were individuals who felt a desire to visit Tanzania and see how we could help in ministering to the Sukuma Tribe. The Mid-South District has worked in partnership with the East of lake Victoria diocese for the last 3 or 4 years and recently began a Church Plant ministry with a goal to reach 1 million Sukuma tribes people in the next 10 years. The team was divided into two groups. A medical team that worked with the medical clinic in Mwanza and looked into the AIDS issue in Tanzania. The second group went into the villages and into the home of Sukuma people in the district of Sengerema. We accepted the warm hospitality offered and shared a simple gospel message with those individuals we met. During this short time in Sengerema we baptized 667 men, women and children. We have many stories to tell you about our visit, one of these is about Pastor Brandt’s robes. Pastor Rudy Brandt served the Lord for sixty years in the ministry of the Lutheran Church Missouri Synod. Although he retired as a full time pastor at Holy Trinity in Bowling Green he continued to serve area congregations as a fill in pastor. He help start up congregations throughout the area, was successful in calling on the sick and shut-ins, and was a great Bible study leader. In fact, he continued to lead these classes until just a few months before he passed away when he became too weak to teach, but he still made sure we had the right material and gave us direction how to proceed without him. Although Pastor Brandt took his final call in 2006 to be with the Father his robes and stoles are still serving the Lord in Tanzania. Just before the mission trip left the US, Joyce Brandt, Pastors wife donated them to be used in Tanzania. 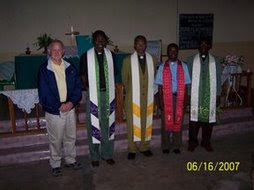 In the attached photos , Pastor Yohana Nzelu, is shown wearing Pastor Brandt’s robe, Pastor Ernest Ambarang’u, and Ezrom Ng’weshemi are shown with two of the donated stoles. A number of other stoles were given to Bishop Bomani to be given to needy pastors in the East of Lake Victoria Diocese. Pastor Yohana is a man cut from the same cloth as Pastor Brandt. He shepards the Church in Sengerema but also serves 14 other sub parishes. Each Sunday, he preaches at three churches that are reached via a two-and-a-halfhour motorbike ride over roads we would consider too rough for travel.The smiles on their faces tell the story as they proudly pose for pictures. Upon receiving the stoles,broke into a song of praise about “BaBa,” which means Father. This gift is an example of a way that we in the Mid-South District can support the church in Tanzania. To accomplish our goal to reach out to 1 million Sukuma people in the next 10 years, we need support. Each gift, large or small, means salvation for a Tanzanian brother or sister. these people to purchase anything but essentials. The typical family income is $1 per day. Bibles in the Sukuma and Swahili language cost $6 each. Motorcycles are $3,000, plus another $1,500 for tires and fuel. 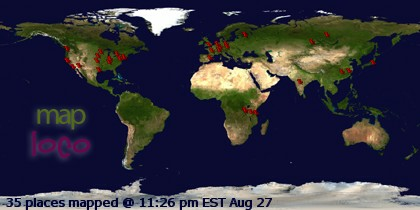 Please pray about what God would have you do to reach these people.